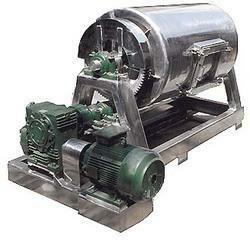 Providing you the best range of ball mill with effective & timely delivery. Our organization offers an extensive range of Ball Mill which is suitable for dry & wet fine grinding , mixing, reacting of color paints. In addition, it is also used in emulsifiers, enamels, refractories and others. These are available in GMP models with mild steel, stainless type.We offer the mills with double mouths for charging & discharging. These are offered with additional gears & pinions for smooth running and power saving.